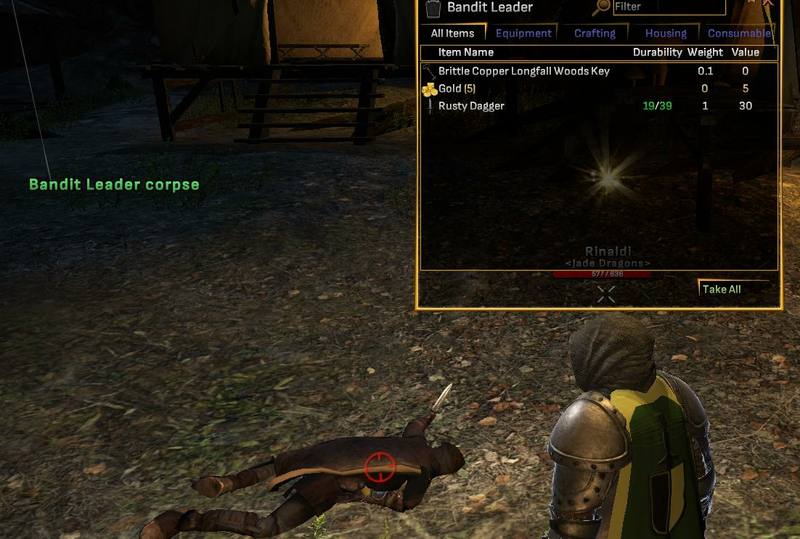 @Rinaldi you are a true master explorer, you deserve an ingame title! I went yesterdy with two friends to explore the new Midras Ruins. We were amazed with the scene. Can't wait to see future new scenes with same visual quality. 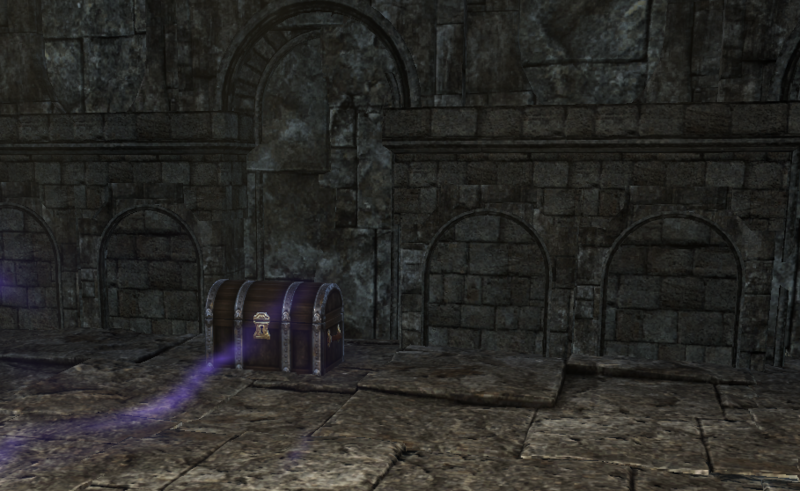 Sadly we didn't find any pvp, but we had a lot of fun exploring and a big surprise with the secret chest. 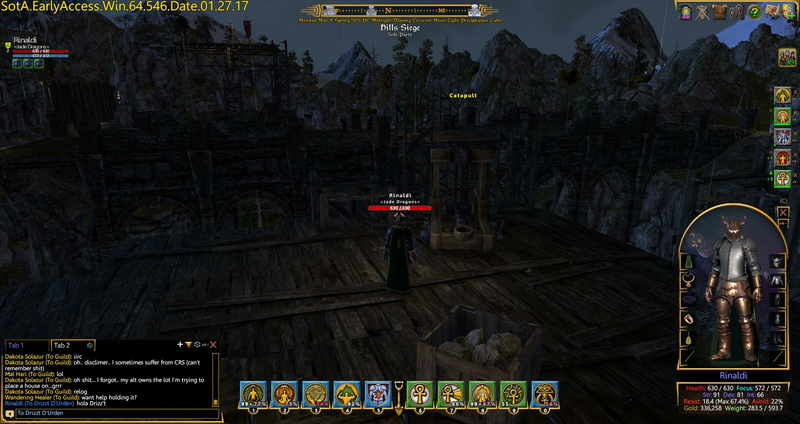 Paladin Michael, CatherineRose, Acred and 2 others like this. 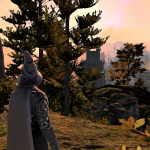 Why is this PvP only if PvP is consensual it need not prevent me to explore this beautifull scene with some exploration content!?!? Why would you feel the need to ask that of someone who is merely providing some solutions to puzzles? Here it is only clutter which Rinaldi obviously cannot answer but which could instead lead to a flamewar that could potentially lock Rinaldi's topic, which would be a real shame. Beli, CatherineRose and Paladin Michael like this. Upon first entering the zone, talk to the Scout. 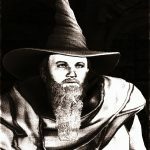 He says he needs you to "destroy every catapult and engineer" and "If their leader shows, to destroy him, too" [the leaders are either 1) a Lich, or 2) one or more Cabalists]. After talking to the scout, head down the North pathway. 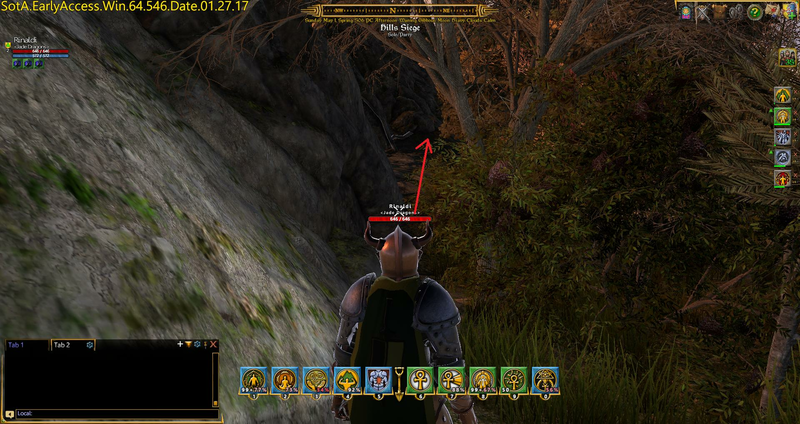 Run a short distance North until you see the gap in the rocks to the Northeast shown below (which is near the first body you encounter). Climb through the gap in the rocks to the plateau above and you'll see the first catapult (with a Siege Engineer guarding it). Kill the engineer and all his cronies, including the re-spawns, until the red flag next to the catapult disappears. Now head back the way you came, and to the place where you first entered the zone. 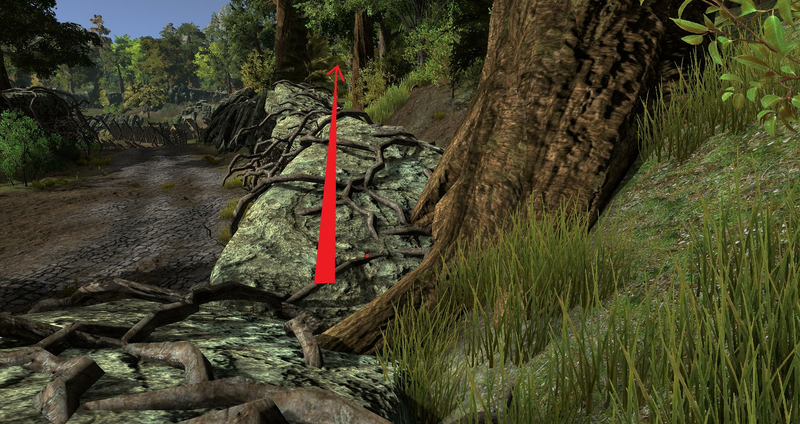 When you are back to where you started the zone, face southwest and then run through the gap in the rocks shown below (be careful not to go too far west, otherwise you will exit the zone). Then, head northeast along the rocks that surround the encampment. 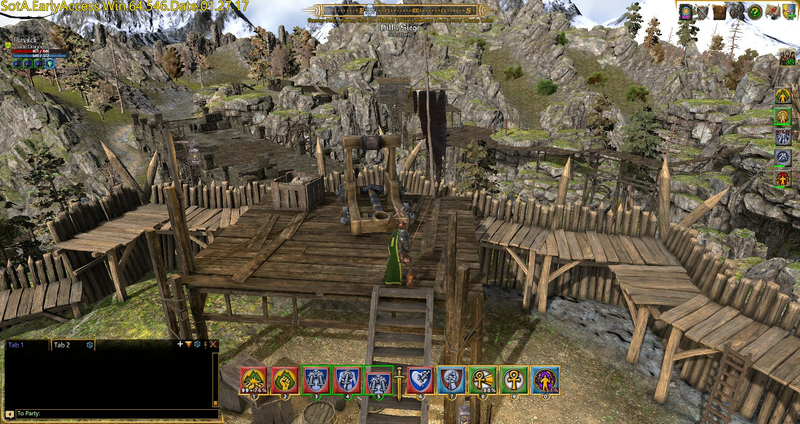 You will eventually see the second catapult (with a Siege Engineer guarding it). Jump down to the catapult. Kill the engineer and all his cronies, including the re-spawns, until the red flag next to the catapult disappears. 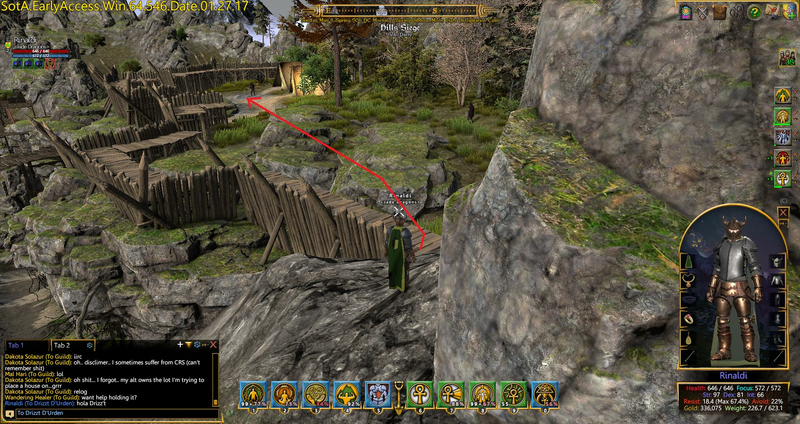 Once the catapult is disabled, run from the catapult toward the Southwest, and run up the rocks (shown below) back into the forest surrounding the encampment. Then, run southeast and follow the ridge of rock. 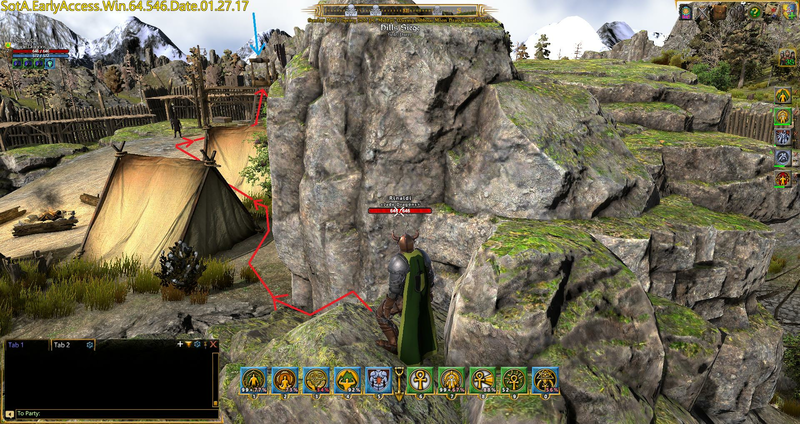 When you have run far enough along the rock ridge, you will see the 3rd catapult (with a Siege Engineer guarding it). Jump down to the catapult. Kill the engineer and all his cronies, including the re-spawns, until the red flag next to the catapult disappears. Now that you have disabled all 3 catapults, you must kill the "leader" Cabalist(s) or Lich to complete the quest. Once you kill the Leader(s), go back to the place where you first entered the zone and talk to the scout again. He thanks you for your heroic service (and this confirms that you have completed to quest). Rentier, Aldo, discipleofweb and 8 others like this. If you take the catapults in the order shown here, you can minimize getting hit by catapult fire and can completely avoid getting hit by multiple catapults at once. Once you get to the top of the hill, stay close to the rocks, run between the tents. Unfortunately, you will encounter a lot of Ebon Cultists, so kill them first. Then run up the stairs. Kill the engineer and all his cronies, including the re-spawns, until the red flag next to the catapult disappears. Now head back the way you came. 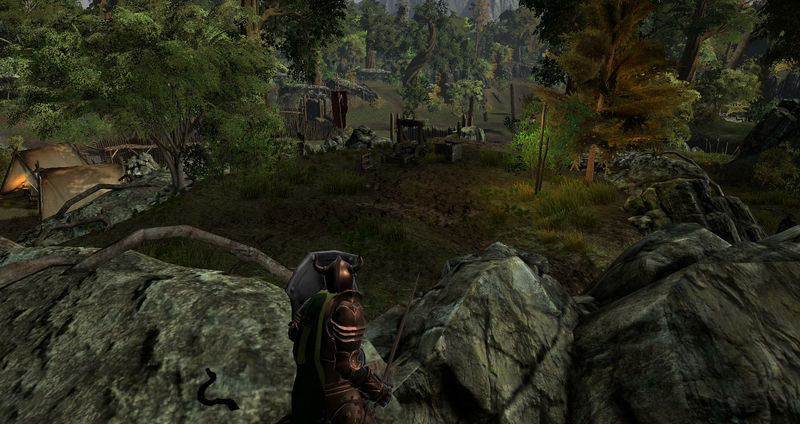 After you run between the tents, immediately turn North and run along the rocks. Keep running along the rocks. 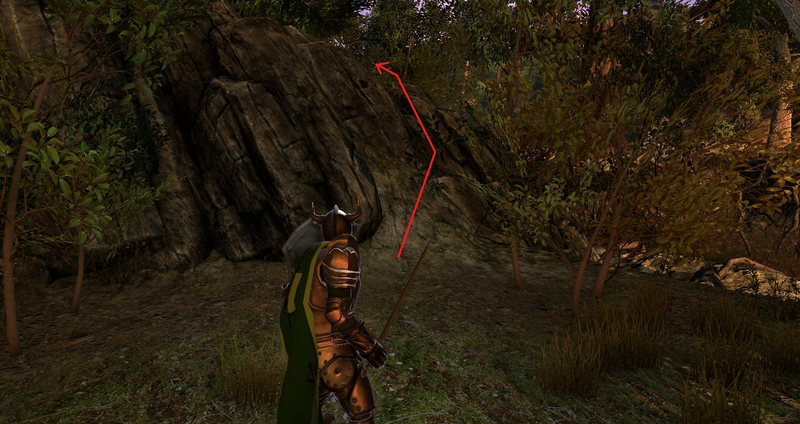 You will reach an area with a pathway to the Northwest, but you want to turn Northeast and run close to the rocks. 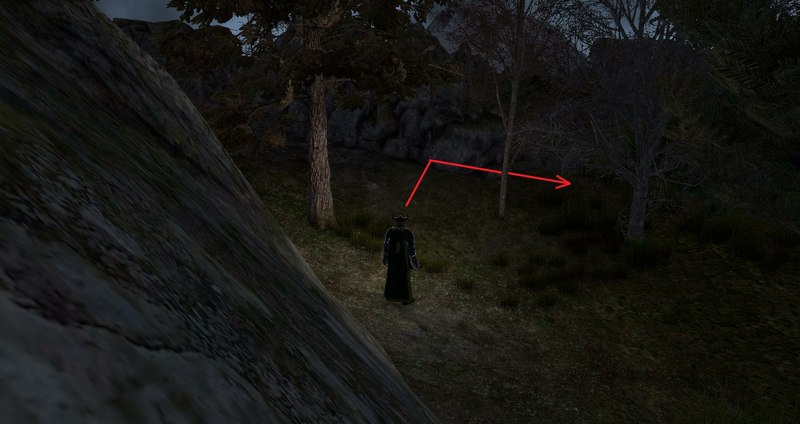 When you see the tree below, run around the tree and turn South. 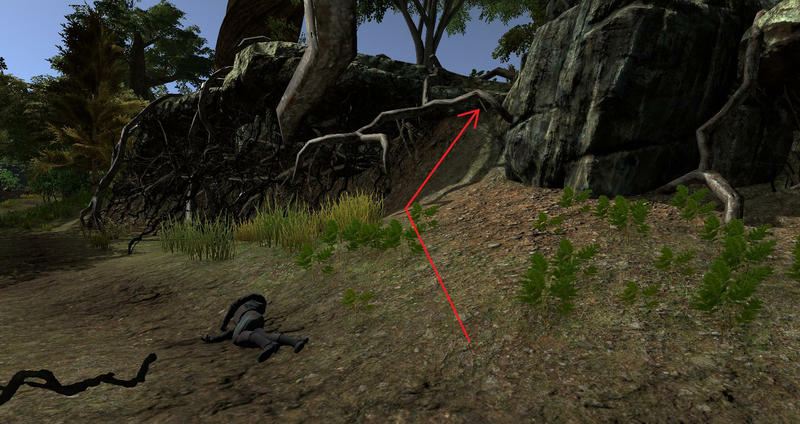 After you run through some shrubs, run up the dirt ramp shown below. 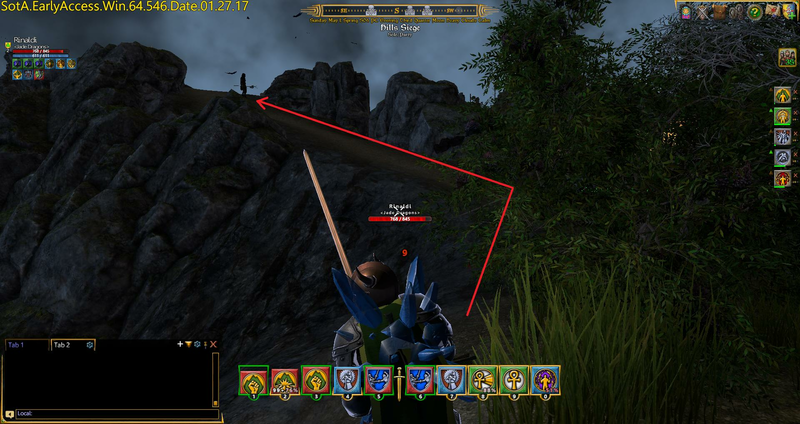 The catapult is at the top of the hill. Occasionally, one of the other catapults will shoot at you. 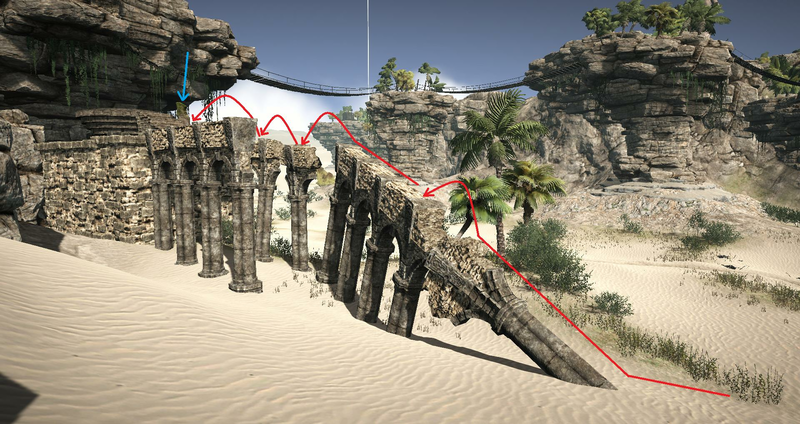 If this occurs, run back onto the dirt ramp, heal, and return to attack the catapult. Now run back the way you came, and go all the way back to where you started the zone. Run up the hill to the South. 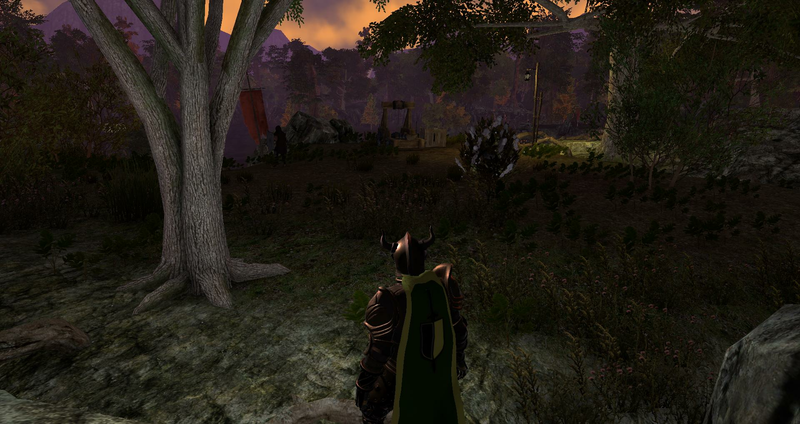 Run through the camp (you may want to kill the all of the Ebon Cultists). Then run through the gait an onto the wooden platform. This leads to the 3rd catapult. Now that you have disabled all 3 catapults, you must kill the "leader" Cabalists or Lich to complete the quest. 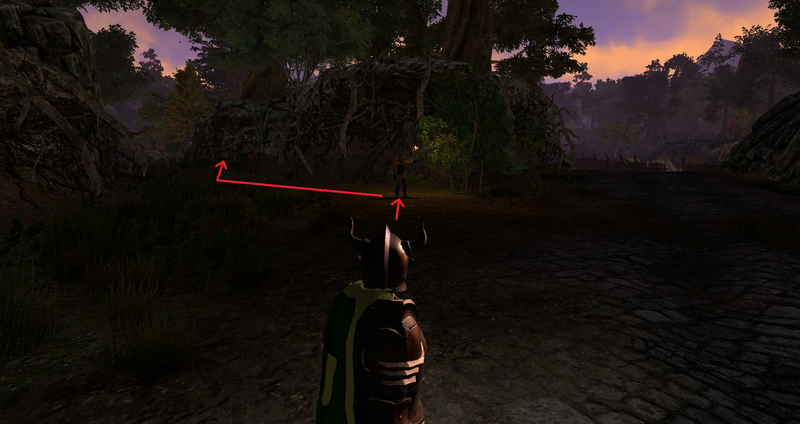 Once you kill the Leader(s), go back to the place where you first entered the zone and talk to the scout again. He thanks you for your heroic service (and this confirms that you have completed to quest). Paladin Michael, Rentier, discipleofweb and 4 others like this. Head to the East Exit for Spite. Facing the exit, there is a log that will be to your right. Follow it and do a little bit of jumping and log-balancing and you'll be treated to a sweet little bird's final resting place. Suspect the poem was written by a developer's child. CatherineRose, Paladin Michael, Rentier and 3 others like this. 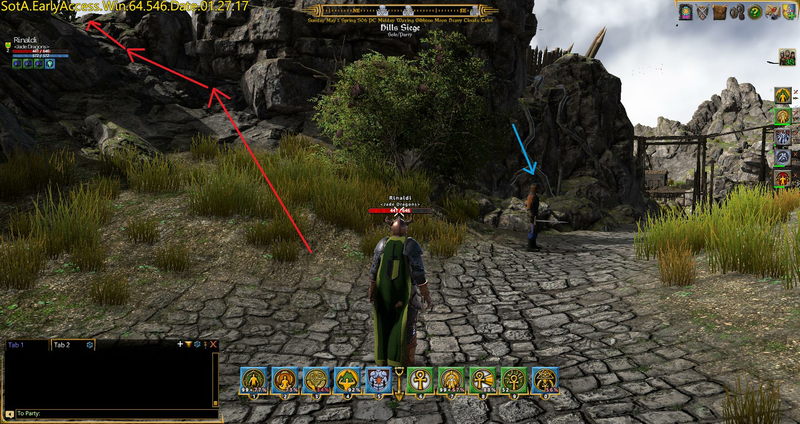 You must de-activate the magical barrier (see red arrow in pic below) in order to pass into the rest of the zone. 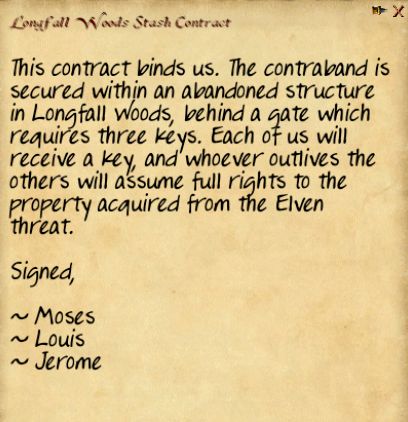 The note then gives 3 additional names, and queries which of these 3 names may be next. 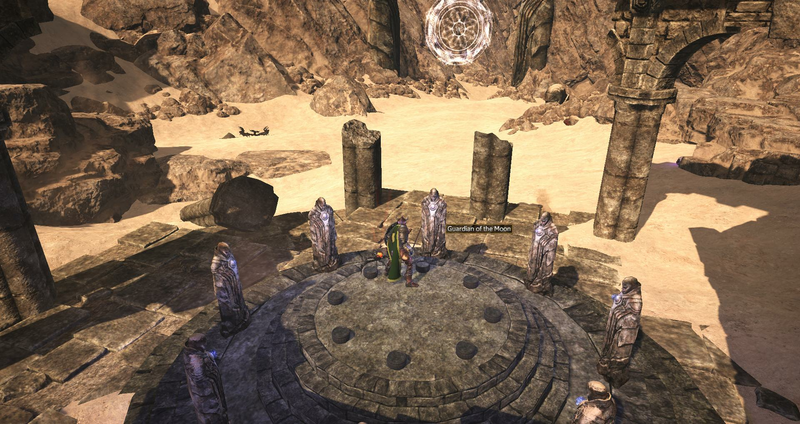 Now, go to the circle of statues shown below. 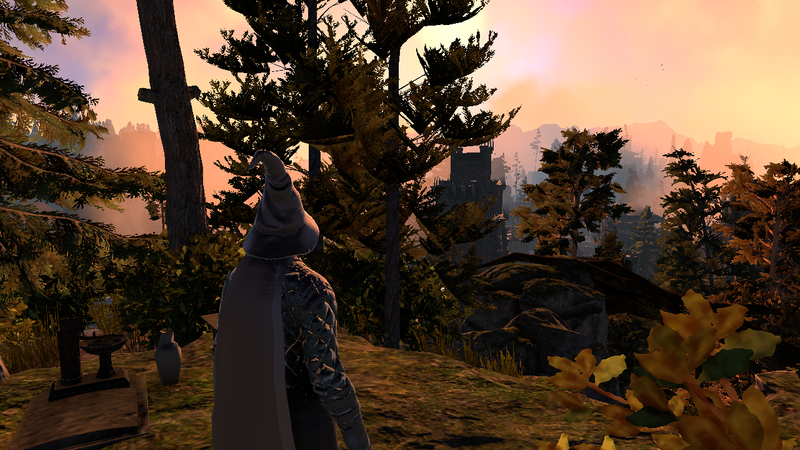 Hover your mouse over the chest of each statue: this will reveal the magic discipline associated with each statue. Now click on the chest of the statues in the order of the magic disciplines referred to in the note above: moon, life, sun, air, death. Once have clicked on the 8 statues in the correct order, the magical barrier disappears, and you can pass into the rest of the zone! Sole, Sean Silverfoot, Chrystoph Reis and 7 others like this. The clues indicate the order in which you have to activate the monoliths. 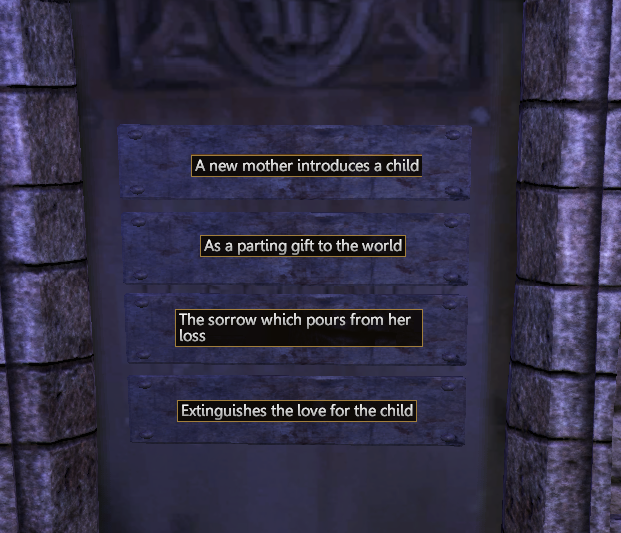 "A new mother introduces a child" - giving birth is introducing a new life (life). "As a parting gift to the world" - parting the world is dying (death). So, the order in which you have to activate the monoliths is: Life, Death, Water, Fire. To activate a monolith, double-click on it. 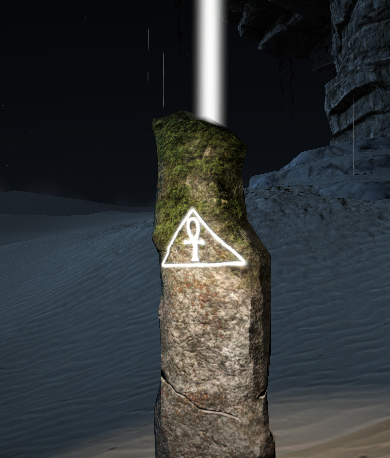 If you click on a monolith in the incorrect order, it will not stay activated: it glows briefly, then stops glowing. 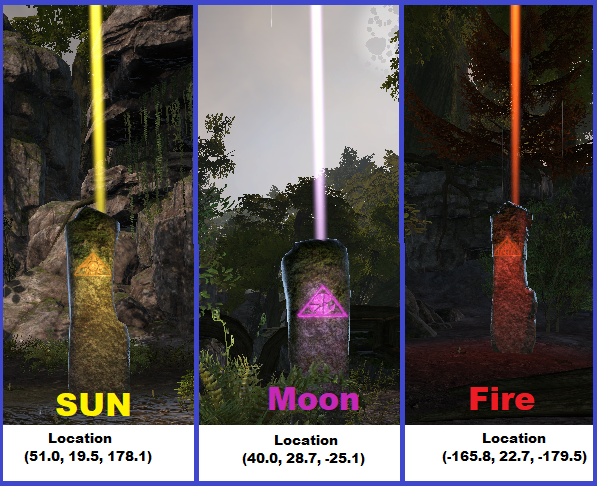 If you click on a monolith in the correct order, it will remain glowing (i.e it stays activated). 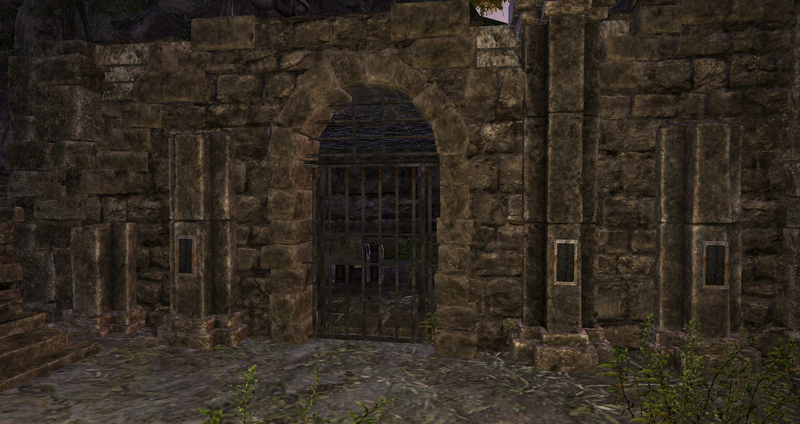 Once you have clicked the 4 monoliths in the correct order, the door to the Necromancer's Lab (i.e. the door with the plaques on it) will open. 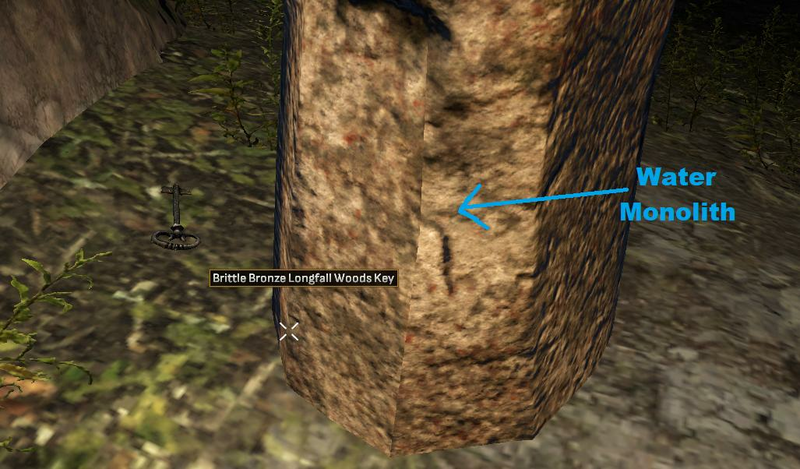 Located between the nomad's tent camp and the wooden elevator. When activated, it glows black (the color of Death magic); well actually, the skull glows dark red and the beam glows black and dark red. When you go through the open door, you will find a Lich, a chest with some loot, and some quartz nodes. 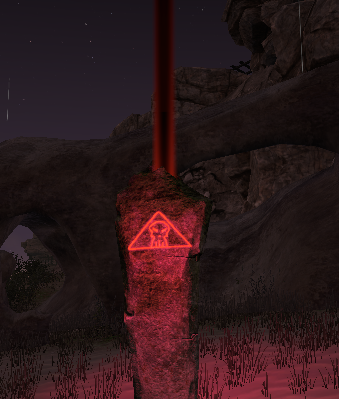 There are two monoliths, each with an eye symbol on it. 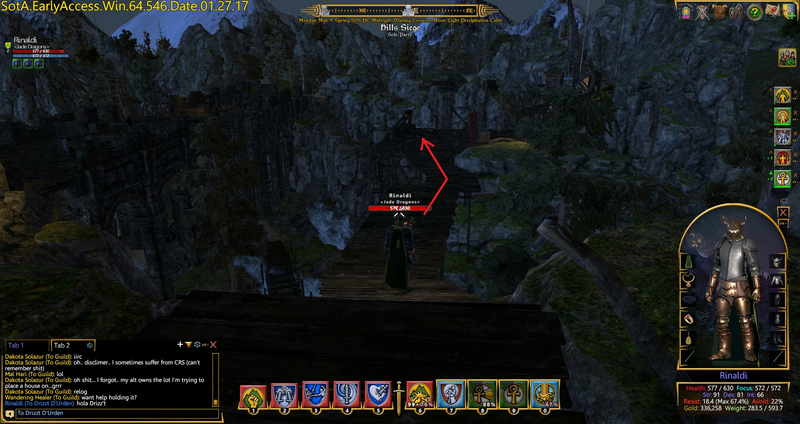 One monolith is at the base of the stone elevator (see blue arrow), and the other is at the top of the stone elevator. 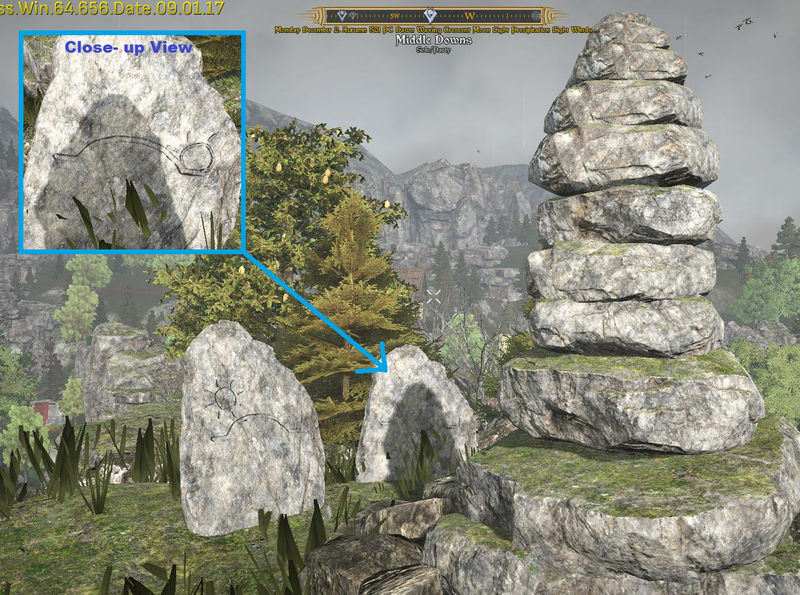 Clicking on these monoliths will raise and lower the circular stone elevator platform (green arrow) so you can reach the Sequanna Colossus statue. These "eye" monoliths have no relation to the door puzzle described above. 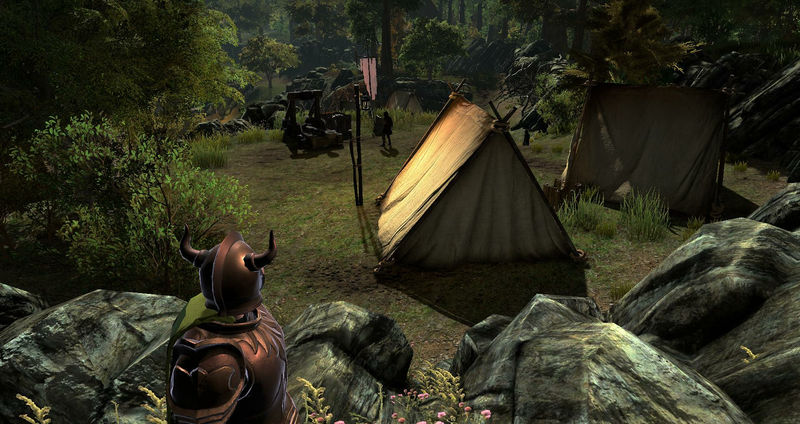 After you get the lens quest from the Oracle in Central Brittany, go to the the Nomad's Camp (the tent village in the Southeast end of Sequanna Colossus) and talk to Aereana. 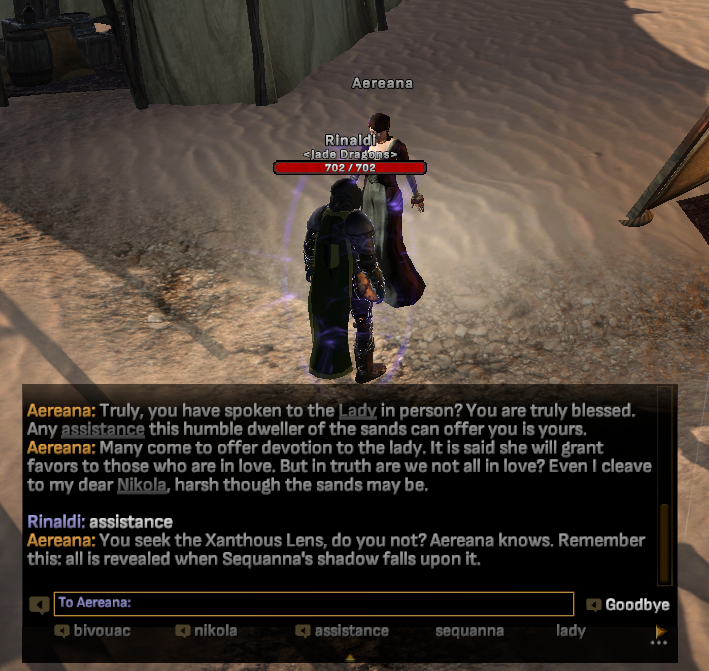 Ask her about "Sequanna" and "assistance", and she says "You seek the Xanthous Lens, do you not? 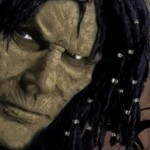 Remember this: All is revealed when Sequanna's shadow falls upon it." 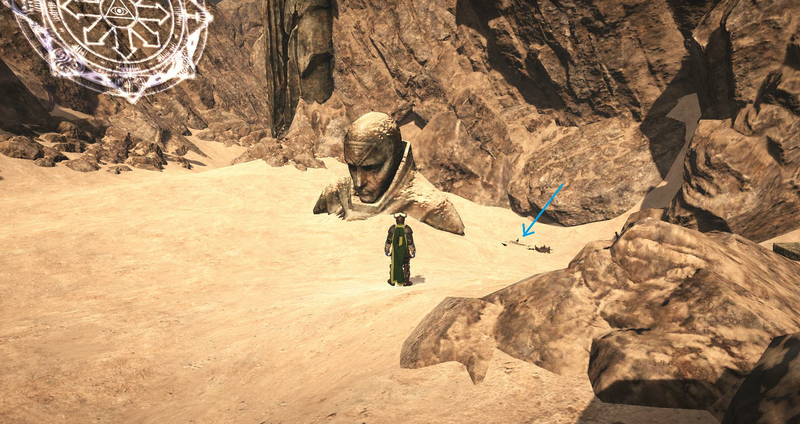 Then, go up to the mesa where the giant Sequanna statue is located (see spoiler above). Once you have taken the elevator up, run along the foot bridges to the statue. 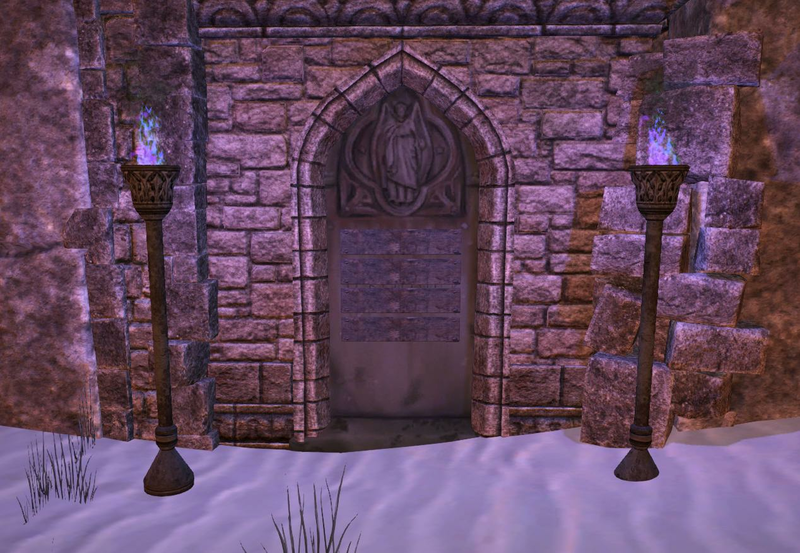 During daytime, the shadow from the Sequanna statue will fall on the shrine of love, and only at this time will the shrine of love become interactive (mouse will turn green when hovering over it). 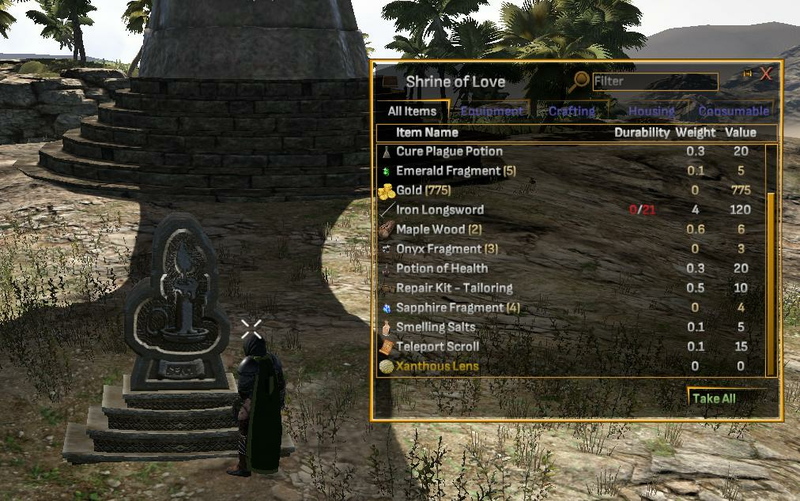 Double click on the Shrine of Love to reveal its contents. 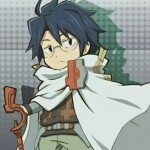 ⒹⒿAlleine Dragonfyre, Paladin Michael, discipleofweb and 7 others like this. Speak to the Monk. He will state "Peace to you. traveler. Meditate and be welcome, here by the Colossus Gate. Say nothing to me and you will receive enlightenment." 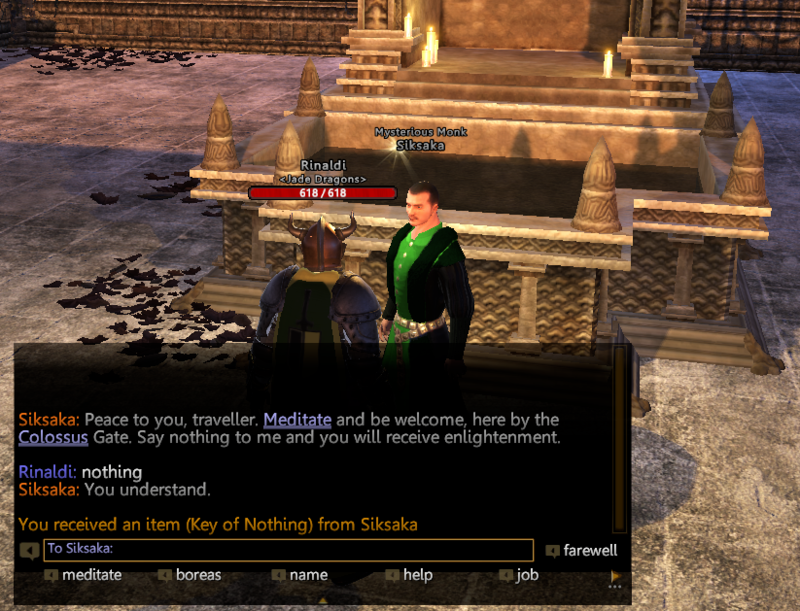 Type "nothing" in the chat box and the monk will give you the key to the first gate (called the "Key of Nothing"). After you pass through the first gate, you will enter an area that has 4 sets of stacked black blocks. 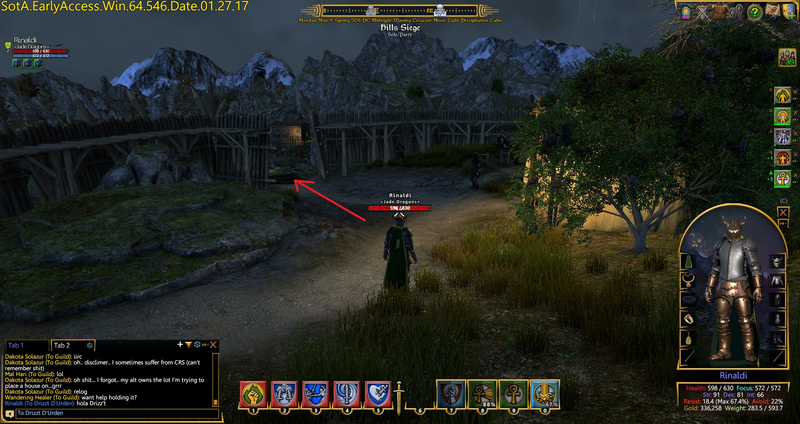 This area has a gate (the second gate) that must be opened in order to progress to the next area. You must arrange the sets of blocks so that each set has the same 3-dimensional pattern, and then the second gate will open. There is a lever on the ground next to the second gate. Flip the lever, and you be teleported to a dark room with 4 small alcoves (the slime room). Each alcove contains a book and some candles. Read each of the books. These books will give you clues that will help you solve subsequent puzzles in Boreas Colossus. 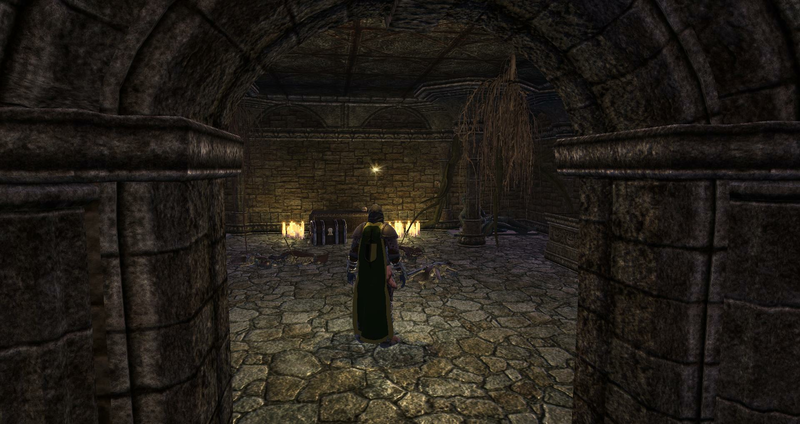 Notice that there are cauldron-like things hanging from the ceiling in front of each side of every alcove. One of the cauldrons has a pulsating light emanating from it. 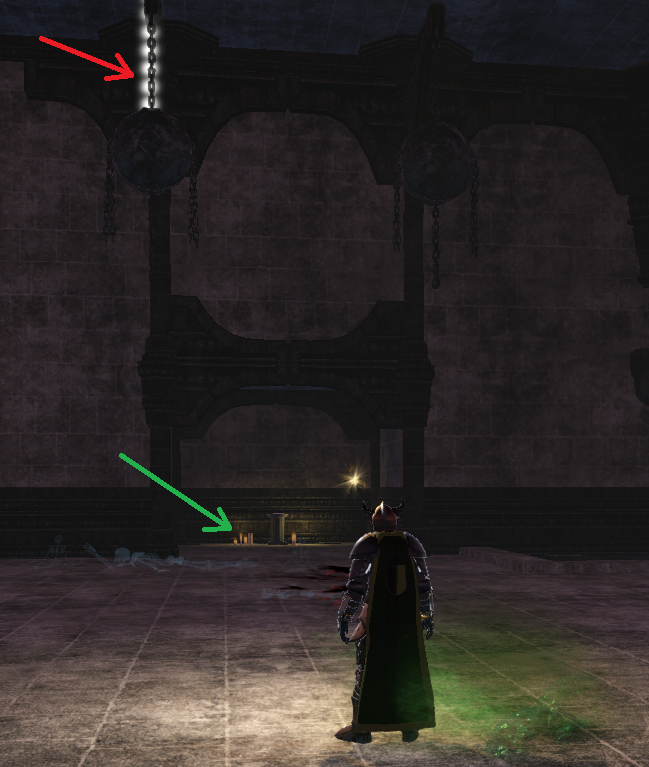 This pulsating light (red arrow below) is a clue directing you to look at the candles (green arrow) on the corresponding side of this alcove. So, take a closer look at this group of candles. The arrangement of these candles provides the answer to the block puzzle: it tells you how to configure each set of blocks. 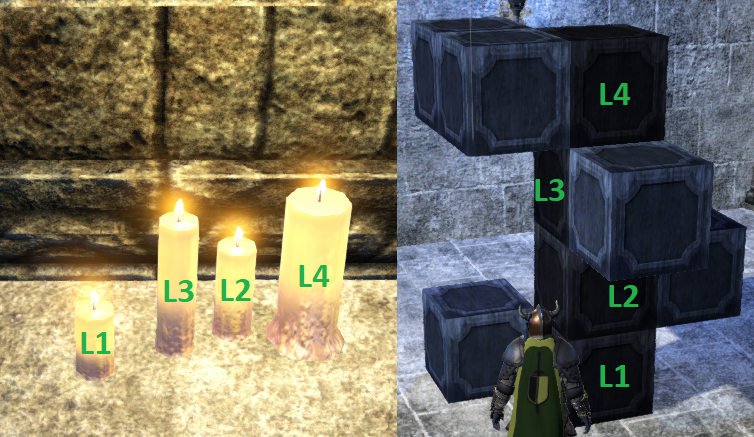 The candle height indicates the level in the block structure. The thickness of the candle indicates the number of blocks that should be at the level represented for that candle. A thin candle indicates that one block should be at the given level, whereas a thick candle indicates that two blocks should be at the given level. 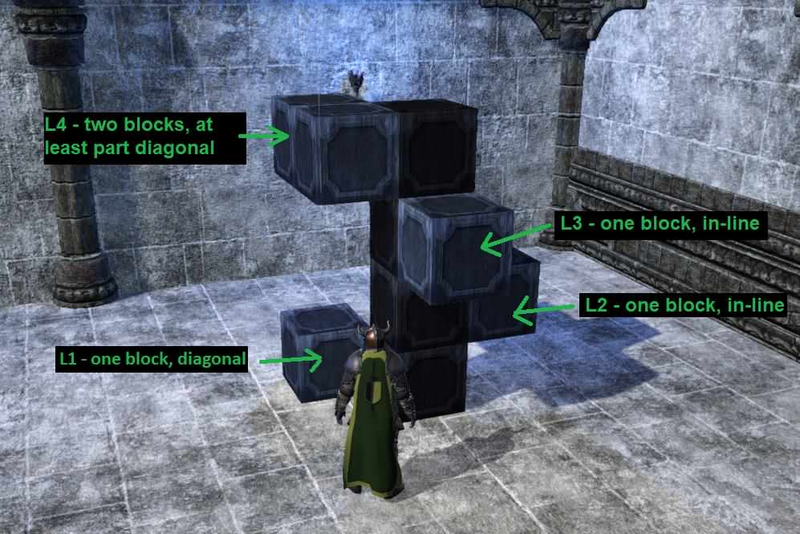 So, based on the picture above, levels L1, L2 and L3 should have only one block, while level L4 should have two blocks. The relative position of the candle hints at the position of a block at the given level. A block can have 8 possible positions at a given level (as shown below). The white squares above are "in-line" with the central black core, whereas the tan squares are diagonal to ("not in-line") with the central black core. The Level 1 (L1) and level 4 (L4) candles are "not in-line" with the other two candles, which means their corresponding block will be in a diagonal position. Once you get all the clues from the candles, exit through the North door of the slime room, which will teleport you back to the beginning of the zone. Run back to the area with the stacked blocks. As you click the blocks, you will see that each block can only be moved into two positions. With this limitation, it is easy to place the blocks into an arrangement that follows the clues described above. That correct arrangement is shown below. 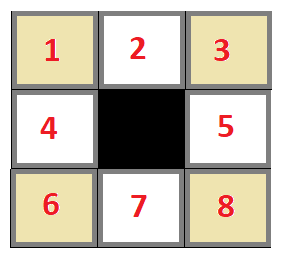 Place each set of blocks in this same arrangement, then flip the lever next to the second gate. If you got the combination correct, the gate will open and you can pass to the next area. If you got the combination wrong, you will get teleported to the slime room. As you run up the hill you will encounter Ghosts and a Ghost Corpian. 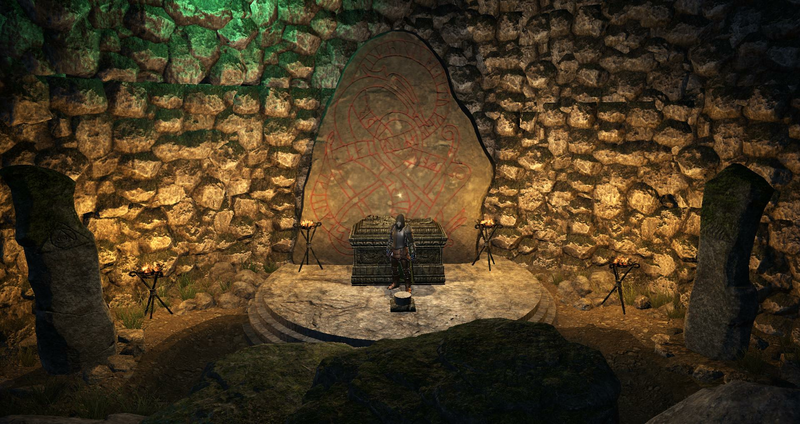 There will also be runes written on the stone wall. 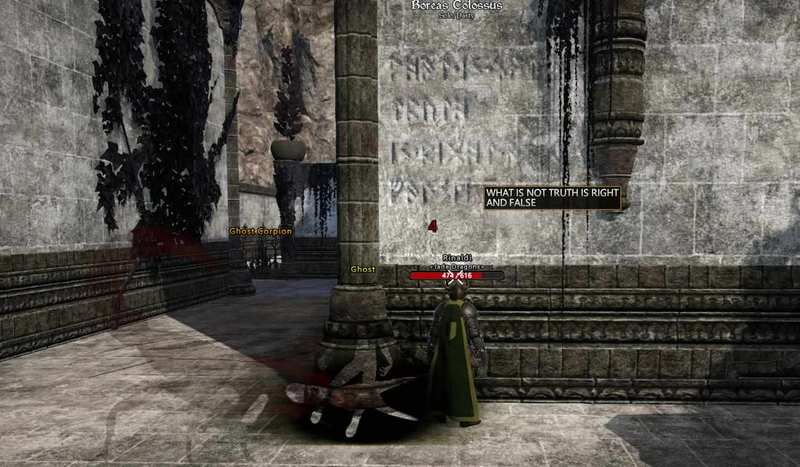 Reading the runes on the wall reveals a clue: "What is not truth is right and false"
1. The floors of the hallways that are on either side of the wall shown above are marked with the symbol of truth (a book). 2. A stone pit where the floor is marked with the symbol of truth (a book). 3. A stone pit where the floor is marked with the symbol of love (a candle). Therefore, all of the areas are marked with the "truth" symbol except one. So, "what is not truth is right" means that the area not marked with the truth symbol (in this case, it is marked with the love symbol) is the "right" (correct) pathway. Click the vine or fall into the pit marked with the candle. 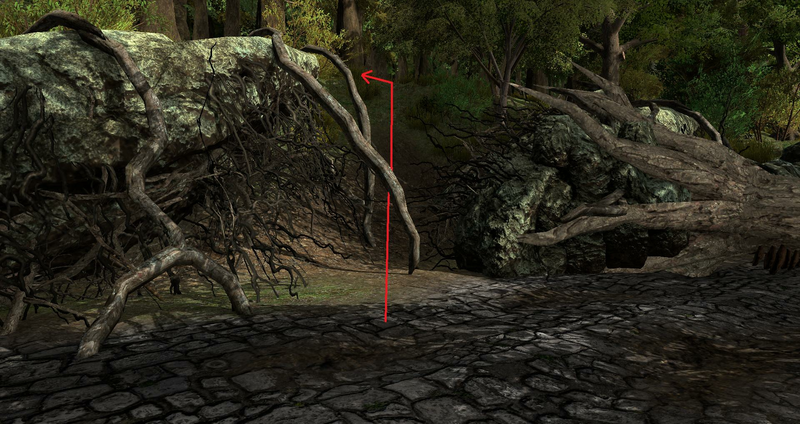 There are 3 hints suggesting that a wall in this pit is an illusion (a fake wall). 1. The first hint is the clue "What is not truth is right and false". If you take the correct path of "not truth", you will find something "false": in this case, a false wall. 2. 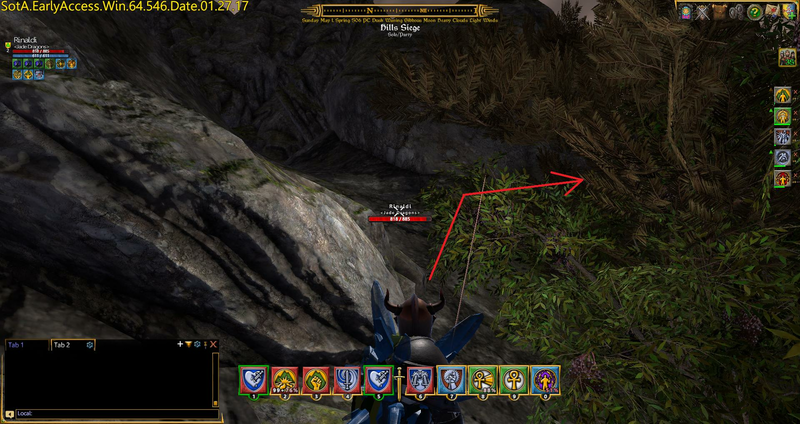 The second hint is the skeleton (green arrow below) whose body appears to be laying beyond the wall. So, you simply walk through this fake wall and progress to the next area. Paladin Michael, Rentier, smack and 9 others like this. 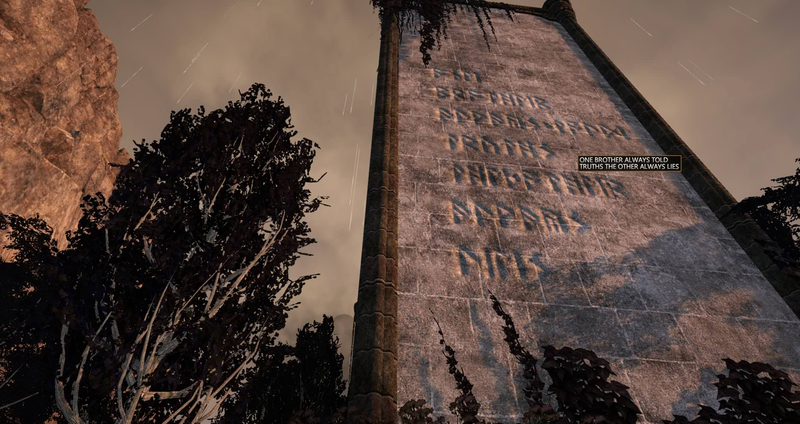 As you run up the hill toward the pit, there is a clue engraved in the the stone wall to the right: "One brother always told truths the other always told lies"
As you continue to run up the hill, you find two stone heads facing each other (the "brothers") with a rectangular pit between them. There is a book in front of each "brother". Recall the clue that one brother always tells the truth, the other always lies. "All he does is stare at me" - this statement by the West brother is true based on the fact the brothers are always facing each other. 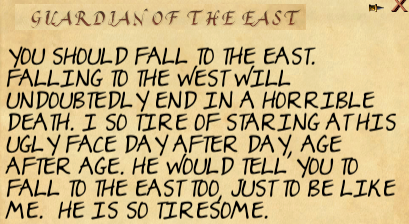 "He would tell you to fall to the East too" - this statement by the East brother is false because the West brother said to fall to the West. 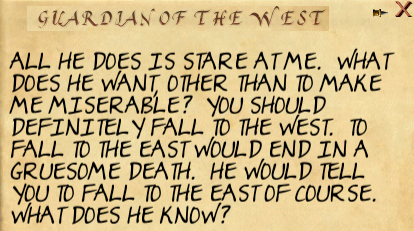 So, the West brother is telling the truth and the East brother is telling lies, which means that you will die if you fall to the East. 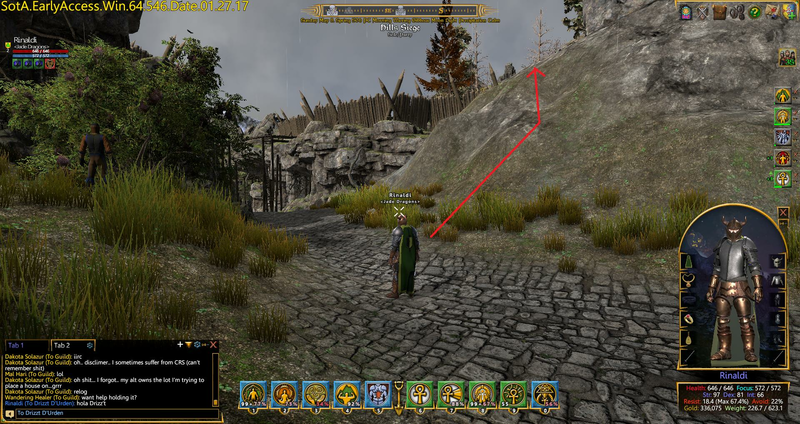 So, stand on the circular platform on the edge of the pit and jump into the west side of the pit. You will land in some water at the bottom of the pit...but you will survive! 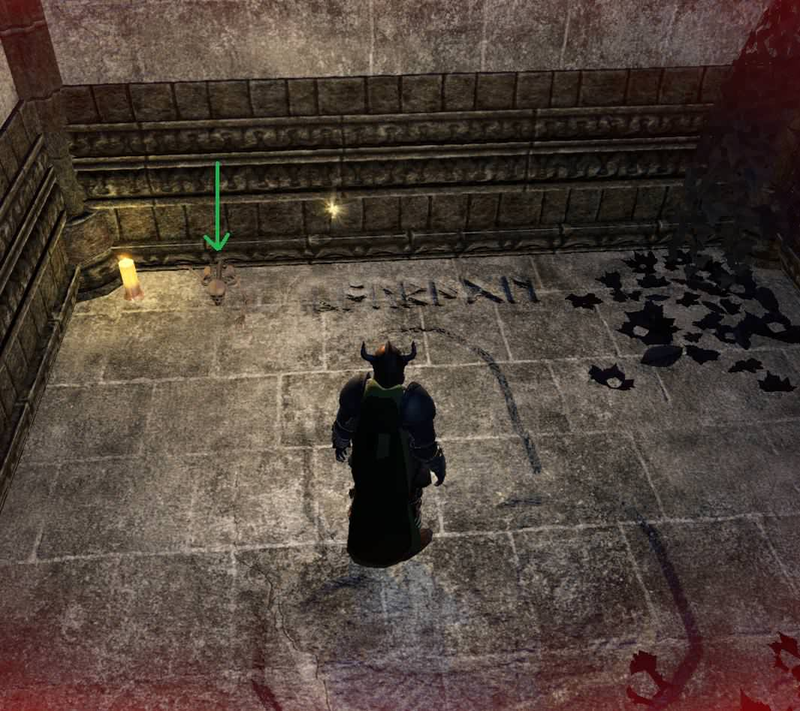 At the bottom of the pit, there are some runes engraved on the wall. 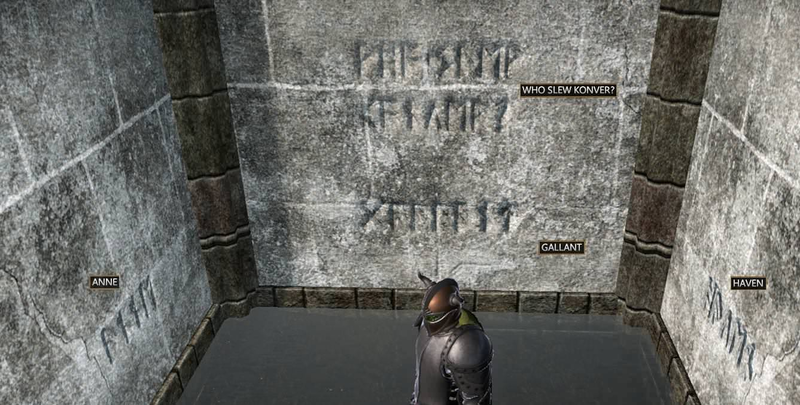 One engraving is the question "Who slew Konver" the other 3 engravings are the names Anne, Gallant, and Haven. If you read all of the books in the slime room, you should be able to answer this question. Here are the pertinent excerpts from the books that will help solve the puzzle. 3 heirs: Gallant, Anne, and Haven. 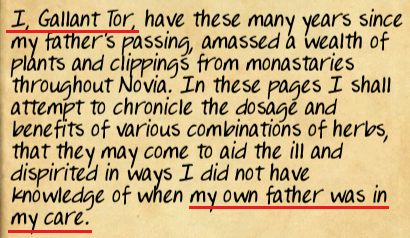 One heir was a valiant knight, one was a nurse, and one was a weaver. 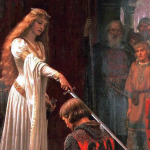 Therefore, Anne must have been the valiant knight. The knight (Anne) slew Konver. If you click the wrong answer, you will be teleported to the beginning of the Boreas zone. 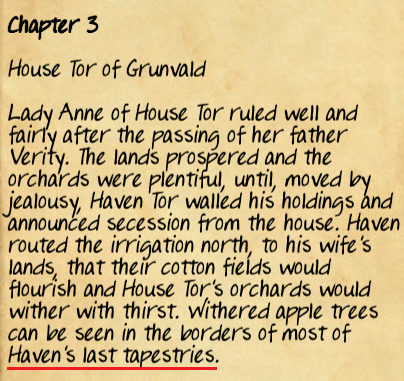 If you click the correct answer (Anne), you progress to the next area. After you make it out of the pit, you will see a chess table. The skeleton is playing the black pieces, and there is an empty chair for the Avatar to sit and play the white pieces. 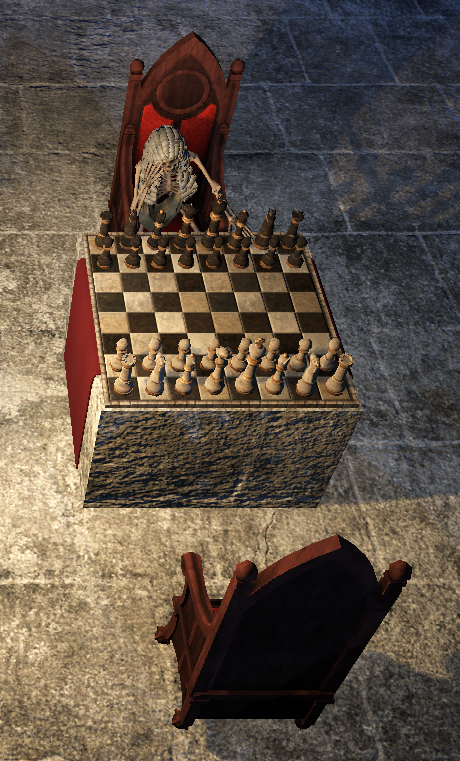 If you click the chess board, you will be teleported to a giant chess room. 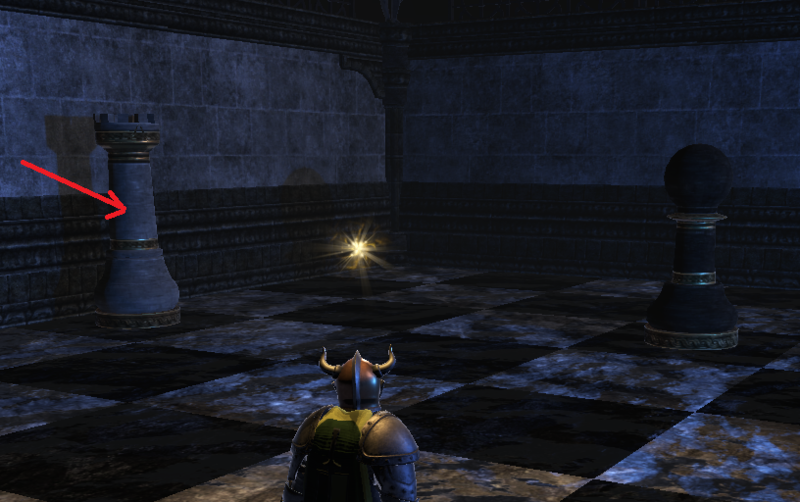 In order to progress to the next area, you have to checkmate the black king in one move for each of the 3 chess rooms. If you do not know how to play chess, this puzzle can be very confusing. 1st chess room - click the pawn in front of white king. 2nd chess room - click the rook that is next to the south wall. 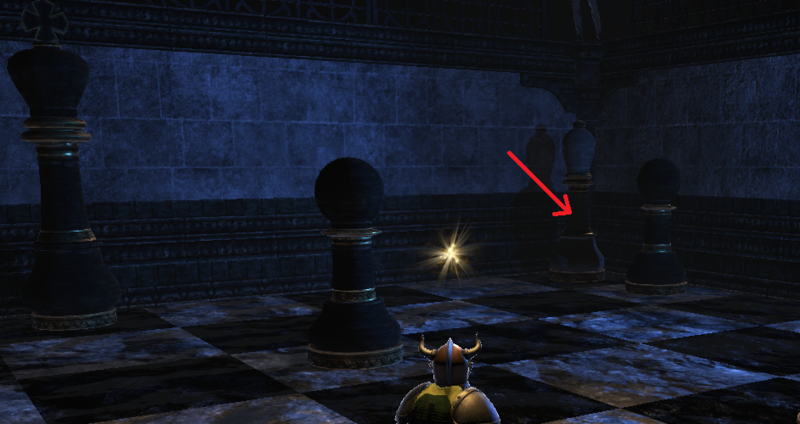 If you click the wrong chess piece, you will be teleported to the beginning of the Boreas zone. 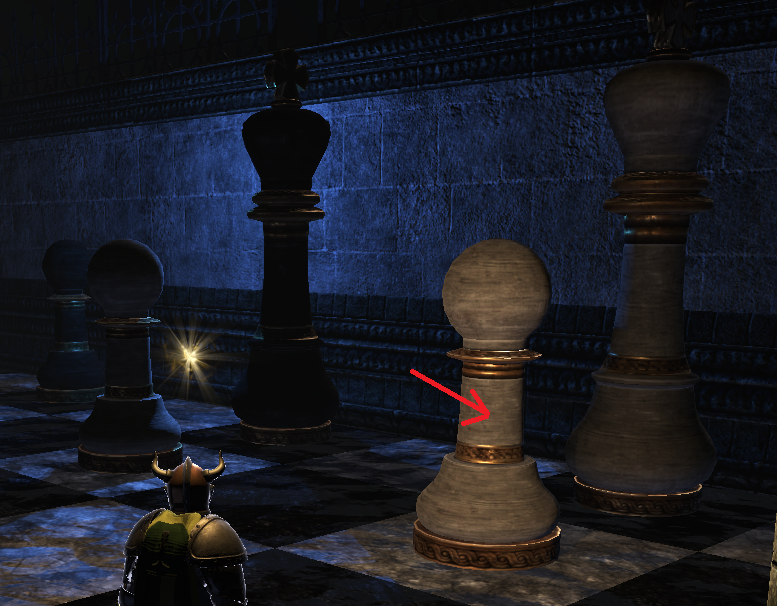 If you click the correct chess piece, you progress to the next area. Once you reach the Dragon, talk to him. 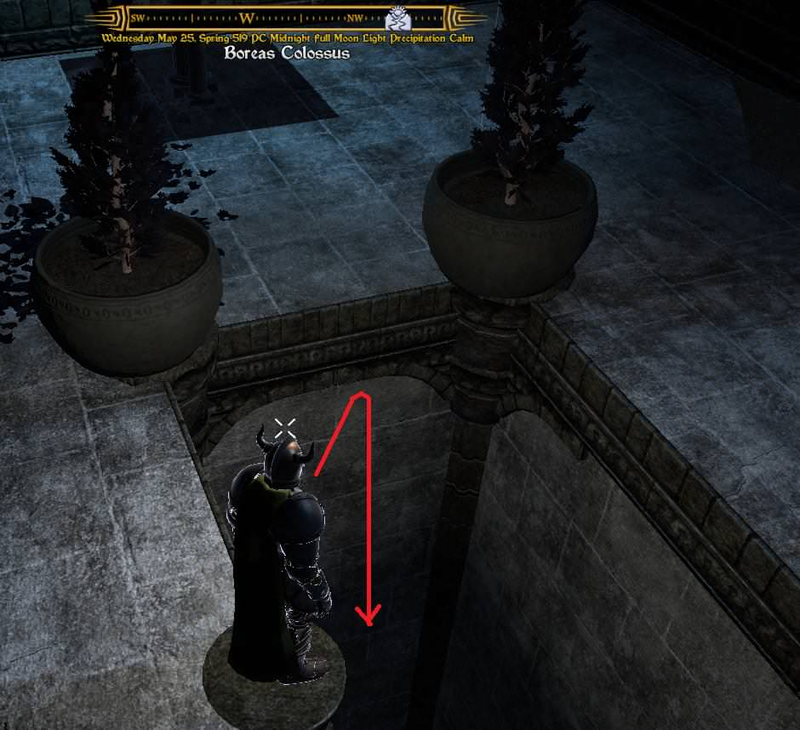 If you answer his 3 riddles, you can pass beyond the magical barrier that blocks the path to the Boreas Colossus statue. If you answer his riddles incorrectly, you will be teleported to the beginning of the Boreas zone. You can easily find the answers to these riddles by searching the internet. I have posted a few of the answers here. Q: There is a house. One enters blind and comes out seeing. What is it? Q: I weaken all men for hours each day. I show you strange visions while you are away. I take you by night, by day take you back. None suffer to have me, but do from my lack. What am I? Q: I am found in the sea and on land, but I do not walk or swim. I travel by foot, but am toeless. No matter where I go, I'm never far from home. What am I? Q: What is easy to get into but hard to get out of? Q: I can bring tears to your eyes, resurrect the dead, make you smile, and reverse time. I form in an instant, but last a lifetime. What am I? Q: What is it that no man ever did see, which never was, always is to be? Q: Four hang, four sprang, two point the way, two to ward off dogs, one dangles after, always rather dirty. What am I? Q: You can see me in water, but I never get wet. What am I? Q: The more you take, the more you leave behind. What am I? 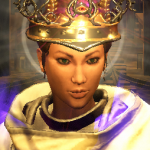 Paladin Michael, Saesa, Rentier and 9 others like this. Paladin Michael, Rinaldi, Rentier and 1 other person like this. I think the first person to solve this puzzle was @Alexander (he posted screen shots of the tomb). Thanks to @Alexander, @Rentier, @Alley Oop, and @discipleofweb for contributing the information in this post. 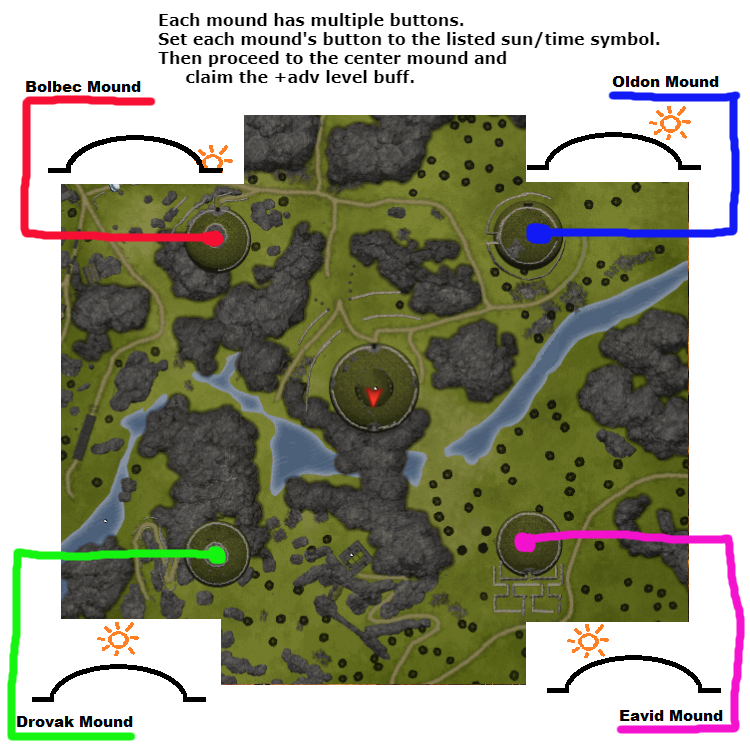 Note: you can figure out which mound you are at by looking at your compass, and hovering your mouse over the largest area-of-interest marker. 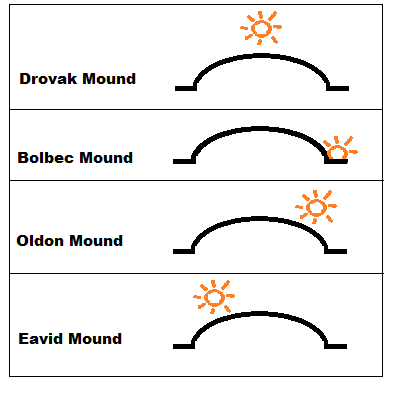 In Middle Downs, the central Mound of the Sun is surrounded by 4 outer mounds (Drovak Mound, Bolbec Mound, Oldon Mound, and Eavid Mound). On the roof of each of the outer mounds, there is a sundial-like device with a stone spire that is surrounded by stone slabs. Each of the stone slabs (which I will call sun stones) has a different depiction of the sun in relation to the mound. 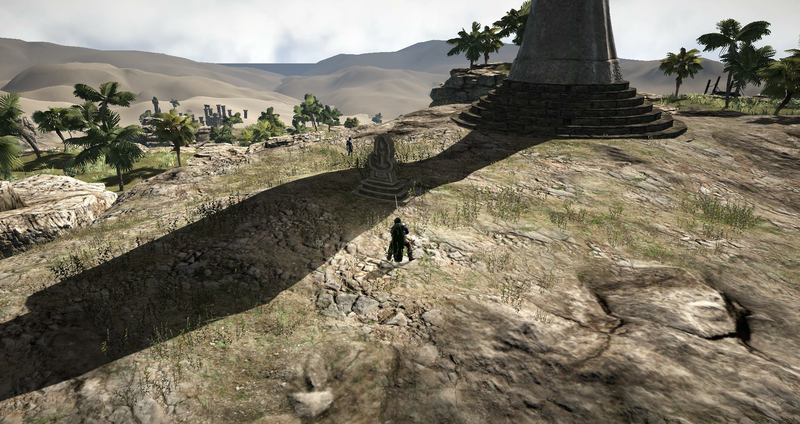 The stone spire casts a shadow that sweeps across some of the sun stones. 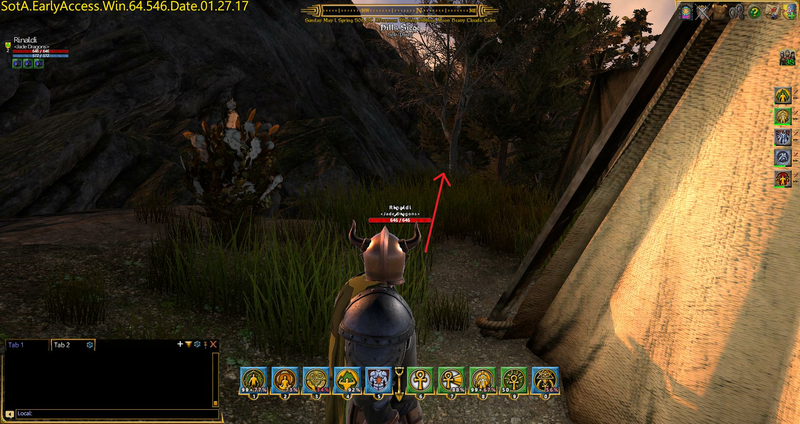 In order to see the shadow, you must have shadows turned on (go to OPTIONS, select VIDEO, and make sure Shadow Distance is set at least to LOW). The sun rises in the East and sets in the West. With some observation of the sun and shadows, you can deduce that the depictions on the sun stones represent the path of the sun during the day, from sunrise (sun on the horizon line at the far right of the depiction) to sunset (sun on the horizon line at the far left of the depiction). This is how the sun would move across the sky if you were facing directly north. Inside each of the outer mounds, there are 4 buttons. Each button has a sun stone next to it. You can activate (press down) only one button per mound. 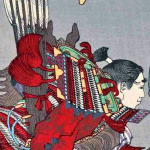 You need to press one button in each outer mound to open the inner chamber of the Mound of the Sun (the order in which you press the buttons does not matter). To figure out the combination of buttons to press, you have to watch the sundial on each mound over the course of the day. How do you Determine Which Buttons to Press? Spoiler: Which buttons do I press? For each mound, there is only one time of day when the spire's shadow falls on a stone where the position of the sun on that stone matches the position of the sun in the sky. The sun's position during this alignment indicates which button must be pressed inside the mound. Here is an example of the sundial on Bolbec Mound at sunrise ("dawn" on the compass shown below). At this time of day, the spire casts a shadow on the stone that depicts a sunrise, so the position of the sun in the sky matches the position of the sun on the stone. 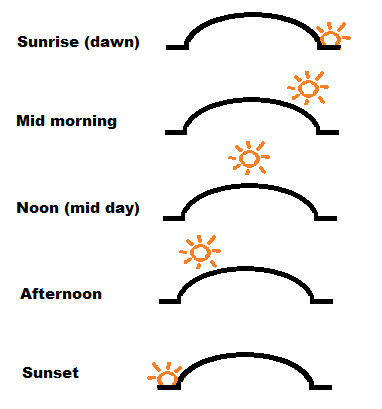 This indicates that the button labelled with a sunrise must be pressed inside Bolbec Mound. 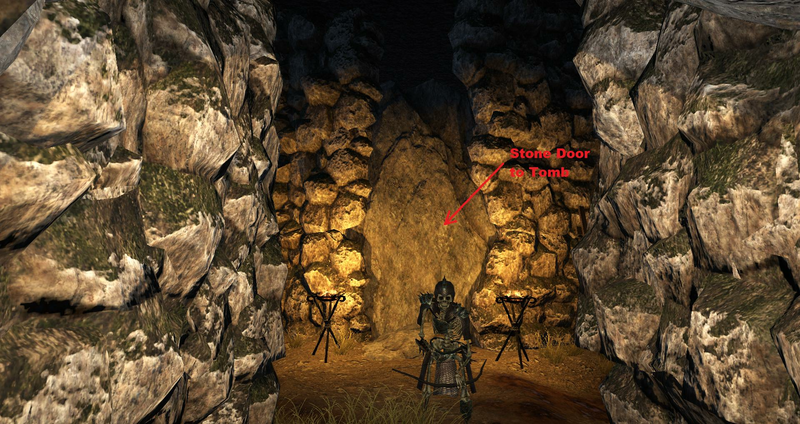 An outer chamber surrounds the inner chamber - to get into the outer chamber, you click on the outer stone door to break through it. An inner chamber - there is a stone door that leads from the outer chamber to the inner chamber; however, you cannot break down this door. To open the door to the inner chamber, you must press the correct button inside each outer mound. Once you press the correct button inside each outer mound, the stone door to the inner chamber will open. 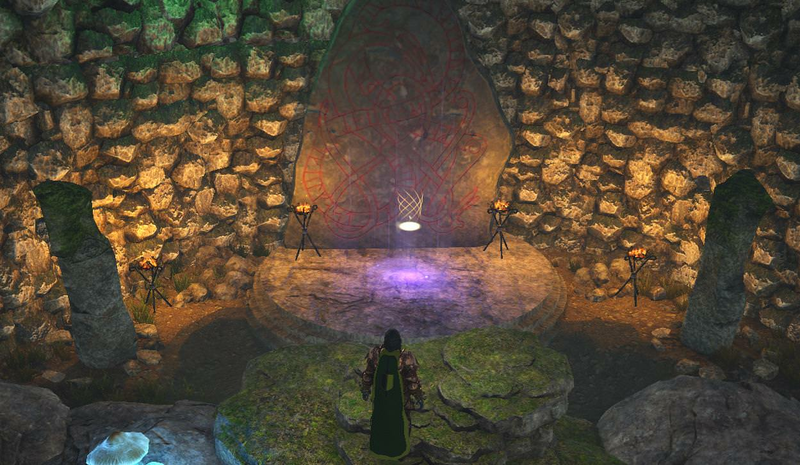 Inside the inner chamber, you will see a glowing aura near the engraved stone. If you enter the aura, you will receive the "Blessing of Skill" which gives +5 adventurer levels for 3 days. If you click on the monoliths inside the tomb, the glyphs on the monoliths will glow (on both the monoliths inside the mound and outside the mound) - but this has nothing to do with the puzzle. Thank you to @Sir Aular Glorthalion who suggested a brief solution and provided the picture. Inside each mound, there are several buttons. Each button is associated with a stone carving that shows the sun in a particular position. Inside each mound, press the button that is associated with the sun carving shown below. Aeryk, Gia2, Tila Tenderfoot and 12 others like this. "To those who seek the Truth;"
"Only that which illuminates the darkness will reveal it,"
"While all else will obscure it." Paladin Michael, Browncoat Jayson and discipleofweb like this. Thanks for the moon stone clue, I got it open with sun, moon and fire. Paladin Michael, Rentier and Cordelayne like this. Thanks for posting @Rentier! I can provide the screen shots. A note is on a table inside one of the tents in the Vigilante Camp tells you that you need to find 3 keys to open the loot stash. 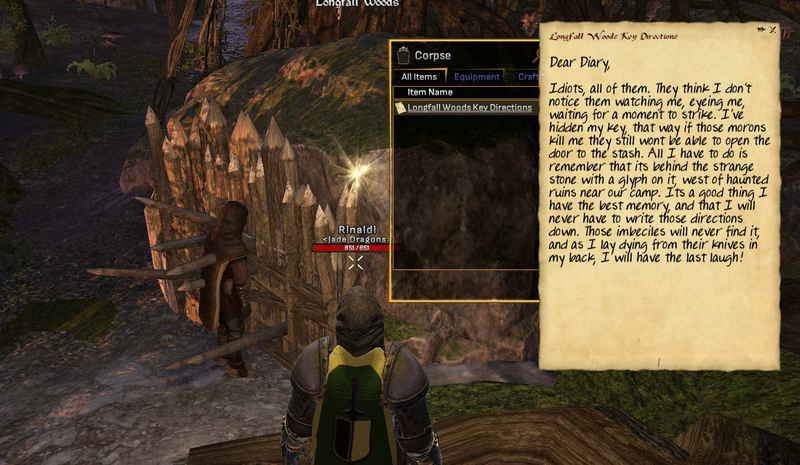 If you follow the directions in his note, it will lead you to the water monolith (Location: -133.8, 19.0, 73.4). 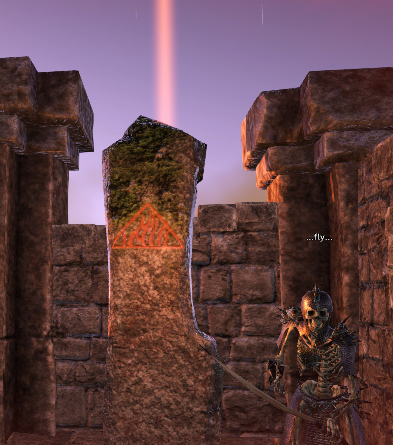 Look behind the monolith and you will see the key. After you have all 3 keys, you can open the gate to the Vigilante Stash (location: 178.1, 34.4, 133.5) and find the treasure chest inside. 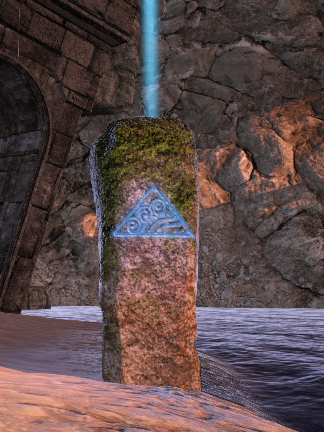 There are monoliths in the zone, and each monolith has the glyph on it that represents a magic type: earth, moon, fire, sun, water, death. Of these magic types, the only ones that are associated with illumination are: sun (sun light), moon (moon beams), and fire (fire light). 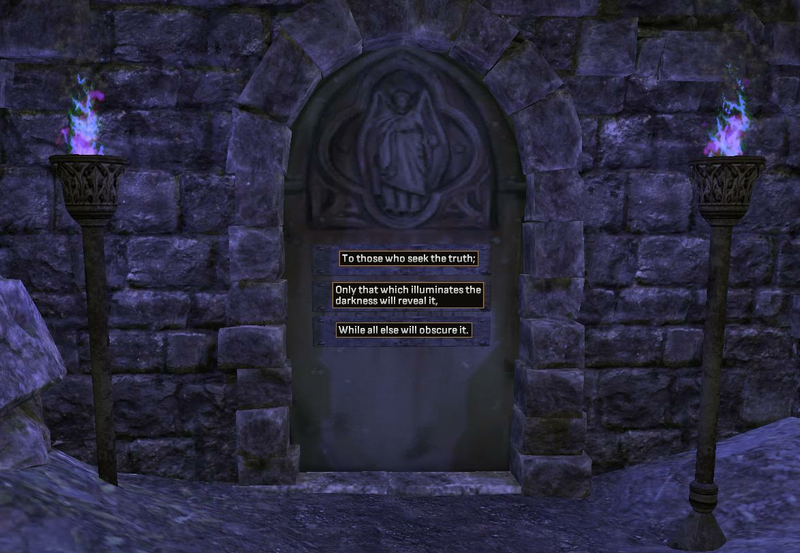 If you click and activate only these 3 monoliths in any order, the door to the crypt will open and reveal what is inside. Inside the Sealed Crypt: lots of skeletons, and a chest full of loot! Paladin Michael, FrostII, Stella Moon and 4 others like this. You need to press one button in each outer mound to open the tomb (the order in which you press the buttons does not matter). 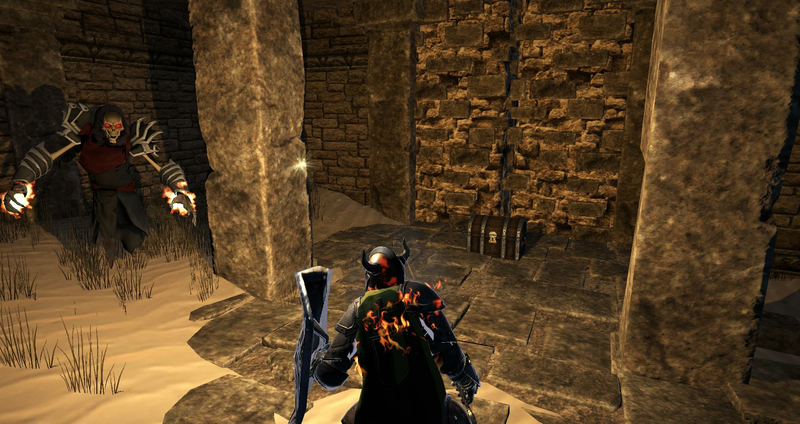 Once you press the correct button inside each outer mound, the stone door inside the Mound of the Sun (see below) will open and you can enter the tomb. If you click on the monoliths inside the tomb, the glyphs on the monoliths will glow (on both the monoliths inside the mound and outside the mound). 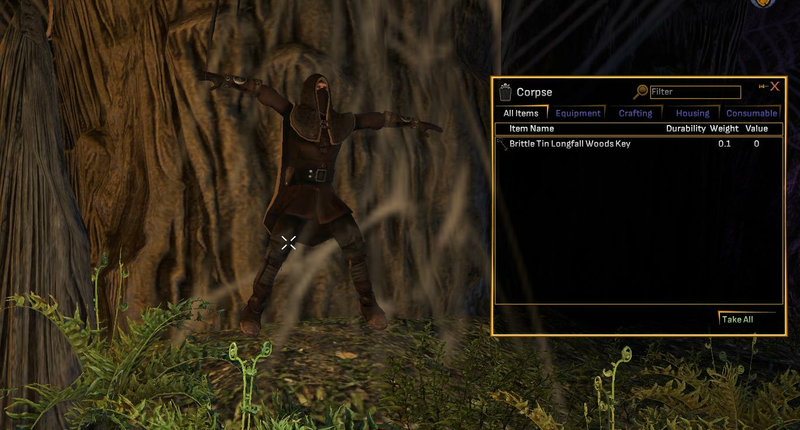 Also, if you click on the button inside the tomb (it is near the feet of the avatar below), you will receive a "Blessing of Courage" which is a buff of +25 strength and + 5 hit points every 5 seconds. The buff lasts 90 seconds. 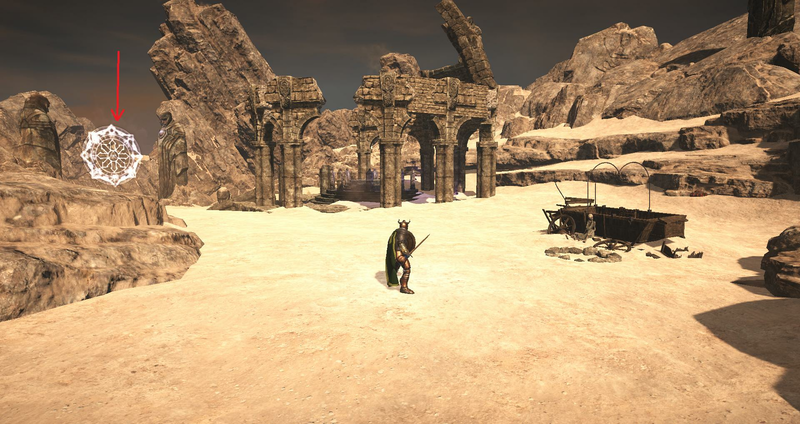 Also, a few higher level skeletons (with ~ 150 hit points) appear just outside the Mound of the Sun, so you can take advantage of killing these more difficult enemies while the buff is active. After a while, the button in the tomb will reset, and you can re-press it to gain the blessing again. There has to be something more to this, right? I felt for sure you'd have to go light the signal fire with the Blessing active (this makes sense) but nothing for me. And the obelisks on the inside? Why the purple symbol when the rest are elemental magic? Paladin Michael, Rinaldi and Rentier like this. The key is nearby on the ground. But the horse seems to be able to get out all the time anyhow. The key is on the ground at the trolls bedside/camp. Spoiler: solution to the statue puzzle (opening the door in the building with the 4 statues in front of it). 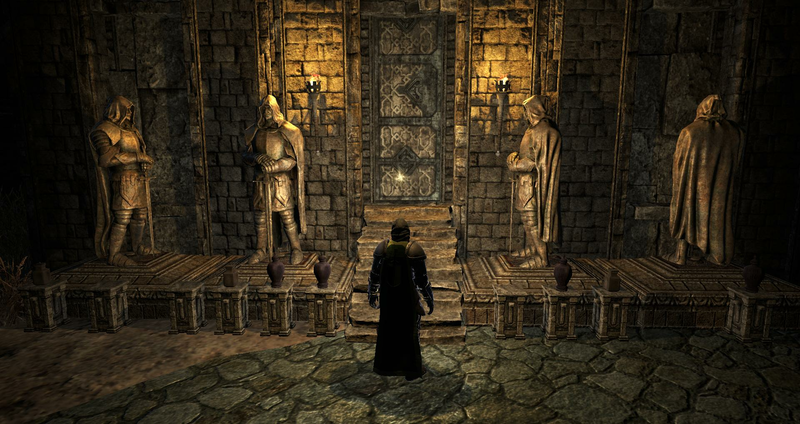 Inside the Stronghold of the Crags (the fortress on the hill), there is building with the 4 statues in front of it (shown below). The door to this building is locked. 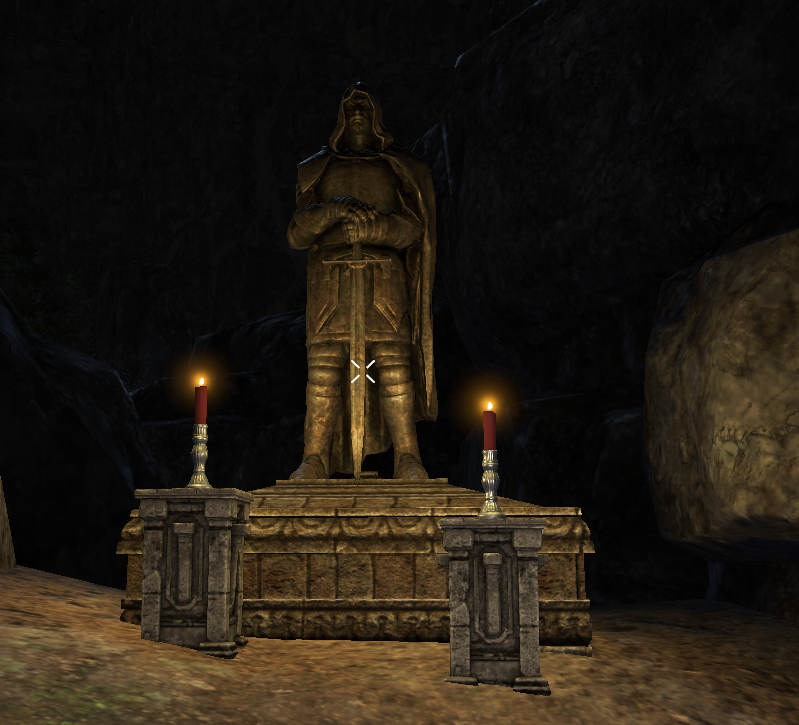 There are also 4 statues outside the stronghold, with each statue located in a different region of the zone. To solve the puzzle, each of the 4 statues outside the stronghold must be rotated so that it faces the correct direction, then the door to the building above will open. Note the number of pedestals in front of each statue (red # in pic below) and the direction that each statue is facing (blue text in pic below). 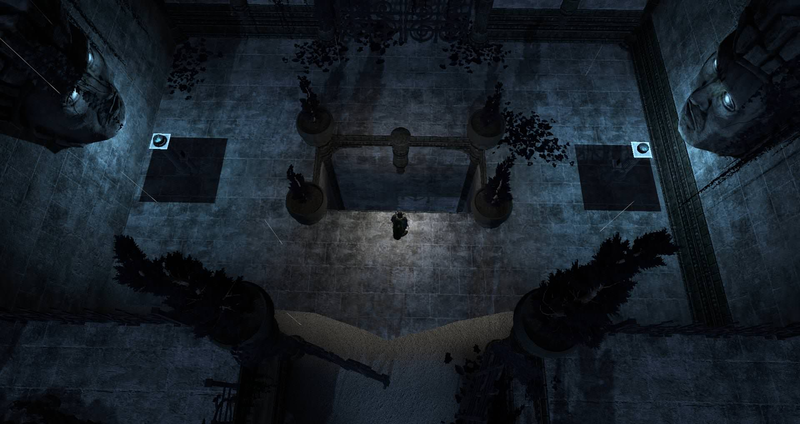 To solve the puzzle, you must rotate the statues outside the stronghold to match the pattern above. 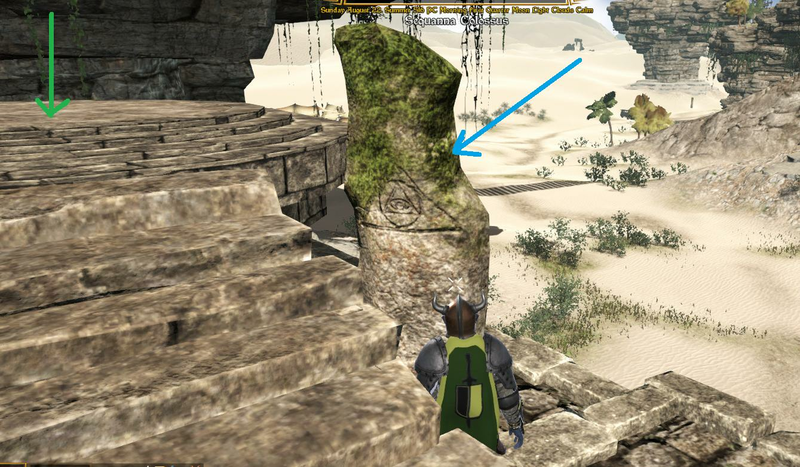 For example, the statue below has 2 pedestals in front of it, so you must rotate the statue (by clicking on it) so that the statue faces East. StarLord and Stella Moon like this.